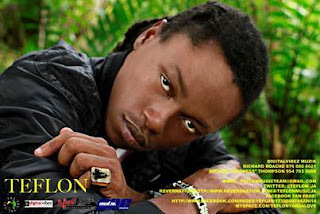 iDancehallReggae.com::Caribbean Lifestyle Media::: "Teflon" teams up with Nike Olympics song producer "Icon"
"Teflon" teams up with Nike Olympics song producer "Icon"
(Mpr Consulting/Shuzzr PR) - Busy rehearsing for his summer tour concerts,Teflon could not pass up the opportunity to go in studio with famed producer Icon. After all he is the man responsible for "On The Go" the Nike Olympics Campaign song, and "On The Go" perfectly captures Teflon's 2012 momentum. The song titled "Do What You Want" already is blazing the dance floors locally, the infectious riddim, catchy chorus and lyrics can't help but make you sing and dance and give you a feel good vibe.